Do you have your RV plugged directly into a power outlet? You shouldn’t. You should plug your RV into a surge protector, which protects all your electronics from power surges. We all might forget about this because everything seems to be going fine, but it only takes one power surge or spike and all of the expensive electronic devices in your RV such as television, PC and refrigerator could become useless. An RV surge protector is one of the MUST-HAVE accessories for the serious RVers. In this article, we’ll walk you through everything you should know about RV surge protectors and how to choose the right one. We’ll also look at some of the best RV surge protectors on the market that we think you should buy. There’re a lot of options out there and they are not the same. We’d highly recommend you consider models from a reputable company (that we listed in this post). The cheapest RV surge protector from an obscure manufacturer may not provide much protection when it’s actually needed. When it comes to choosing the best RV surge protectors, 50 Amp or 30 Amp, Progressive Industries and Surge Guard are two of the most trusted surge protector brands in the world. They are both located in the USA and offer excellent customer services. Where do your RV get power from? A generator, solar panel system, or shore power? In fact, most RVs today get power from an outlet on a pole located in the campsite to run appliances as well as to recharge the deep cycle batteries. These electrical outlets are older, poorly maintained, or wired in a Do-it-yourself fashion by someone who lacked proper training. Most problems aren’t too dangerous to people or animals, fortunately. The most common problem is under-voltage, over-voltage and spike can occur when the voltage suddenly increases in some cases. Mis-wired or damaged pedestals: such as no neutral, no ground, reverse polarity. These can all cause immediate damage to many or all of your 120V appliances and/or cause personal injury. Power Surges: Everyone can usually relate surges to storms but, in reality, surges can be caused by other external sources such as blackouts, power or industrial plants powering on or off, and even within the RV park by power inconsistency. Low or High Voltage: 120V appliances operating ranges are 102V to 132V. Operating appliances below or above this operating voltage will cause heat buildup. Voltage below 102V or above 132V will cause appliance degradation damage, while voltages below 95V or above 140V can cause immediate damage. The best RV surge protectors will not only protect the coach from voltage surges, they automatically test pedestal wiring and voltage and won’t allow power to the coach if there are any electrical issues. The best models also incorporate a time delay to prevent short cycling and protect the coach’s A/C system. Should you have low voltage or high voltage conditions, they will automatically cut power to protect the coach, and automatically return electrical service when safe power returns. What more? Some models will even SELF-SACRIFICE to save the coach should the RVer accidentally plug into an incorrect power source or a surge that exceeds its protection rating. The Surge Guard 34850 Portable Surge Protector with LCD Display is the best 50 amp surge protector available. This is an upgrade version of the Surge Guard 34750, which is one of the most popular RV surge protectors so far. The 34850 has 3850 Joules of power surge protection. It can be used for all travel trailers 30 amp and 50 amp without any issue. 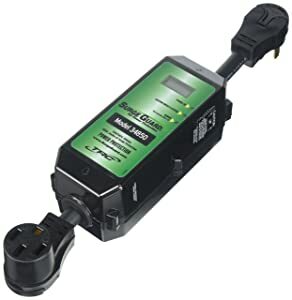 The Surge Guard 34850 Portable Surge Protector protects your RV from faulty park power by automatically shutting off power when an open neutral (which can cause severe electrical damage) or low (<102V) and high (>132V) voltage is present. It also shuts off if a reverse polarity is present. Plus, this unit continuously monitors and checks for spikes or irregularities in the power supply that your RV is pulling from. If anything were to ever become a problem, the surge protector will stop the power flow to your RV before it can damage any of your electrical system or equipment. When it shuts off the power for this or any other cause, it will automatically reset once the power problem has been corrected. However, there is a 128-second delay built in to allow the head pressure to bleed off on the RV’s air conditioner prior to reconnecting the power. The built-in LCD display is continuously monitoring voltage and amp draw. The Display also monitors and reveals faults like reverse polarity, miswired pedestals, elevated ground voltage. You can relax and enjoy your vacation knowing that the Surge Guard 34850 portable surge guard is standing guard to protect your electrical appliances from unforeseeable power problems. Overall, we are confident that the Surge Guard 34850 is one of the best RV surge protectors you can buy. You can’t go wrong with it. The second best 50 amp RV surge protector on our list is the Progressive Industries EMS-PT50X Portable RV Surge Protector. This surge protector has a sleek and compact design that makes it easy to use and store. With all weather shield assembly, you can confidently use it anytime and anywhere without any issue. One of the things that we love most of this model is that it’s made in the USA. So there is no doubt if say it’s built with the great dependability and safety in mind. The EMS-PT50X is the newest in the line of Progressive Industries portable surge protectors and is the best surge protector that the company has been making so far. Progressive Industries listened to what customers had to say and made some impressive new improvements to the design and function of this model. It protects your 50 Amp RV from 5 modes of electrical issues. The smart technology utilized by the PT50X provides high & low voltage protection, whenever source power falls below 104 Volts, or rises above 132 volts and will automatically shut down power to the RV. The EMS will monitor the power and once the AC power rises above 104 volts, or below the 132-volt level, the time delay indicator flashes for the present time and then automatically restores power to the RV. And the all new weather protection shield keeps your RV’s power cord out of the rain. If you’re looking for the best RV surge protector that can be permanently installed within the bay of your coach, preventing potential theft and damage from the elements, the Surge Guard 35550 Hardwire Surge Protector is one of the best options to buy. 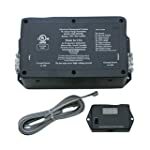 This 50 amp hardwired Surge Guard monitors shore power continuously and shuts off when it detects power surges, open ground, open neutral, low or excessive voltage, miswired pedestals, or reverse polarity that could damage electronic equipment in your coach. The Surge Guard 35550 Hardwire Surge Protector is an upgrade version of the Model 34560, which has been very popular in the RV world. The Surge Guard 35550 offers almost the same features and benefits as the portable unit, the only distinction is that it’s designed to be installed in the RV and you will need an optional LCD display (Model 40298 Remote Power Monitor LCD Display) to monitor what is passing through the device. When connected to the Surge Guard hardwire, the optional plug and play LCD Display, with 16 information fault screens, shows more detailed information regarding incoming line voltages, current being used, and fault conditions than with just a Surge Guard unit alone. 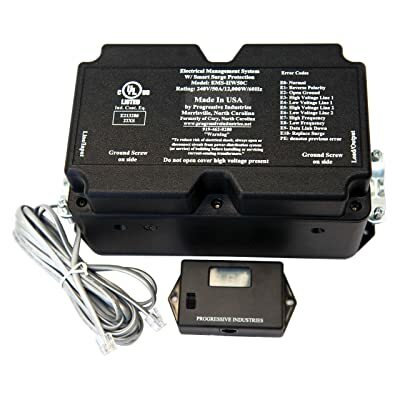 The Progressive Industries 50 Amp HW50C Hardwired EMS Surge & Electrical Protection is permanently installed in your coach so it is always watching out for you and it is kept safe behind locked doors. When Progressive Systems says they are monitoring, they really are – 24 hours a day. The response rate is lightning fast at 1 billionth of a second! The Progressive Industries HW50C is not just a surge guard, it is a management system that gives you Multi-Modes of surge protection, L-N, L-N, L-G, L-L, and N-G, with a joule rating of 3580, and an 88,000A surge current. It has a state-of-the-art computer and microprocessor programmed with software that constantly assesses for all the power problems you could imagine. It turns off power in any of these situations, accidental 220V, open ground, reverse polarity, open neutral, or AC frequency deviations. 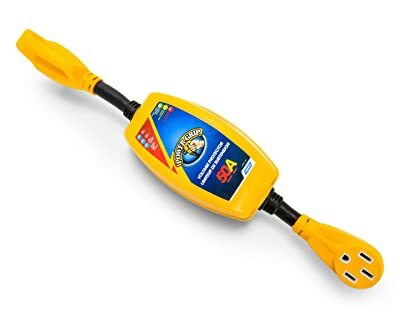 It is also watching out for high and low voltage spikes and instantly shuts down power if there is a drop below 104 volts or a rise above 132 volts. Once the electrical power rises above 104-volts, or below the 132-volt level, the time delay indicator flashes for the preset time and then automatically restores power to the RV. Remote digital readout features built-in surge fault indication, amperage meter, voltage meter, frequency meter, 3-mode surge protection, reverse polarity protection, open neutral/open ground protection, lost/open neutral protection, and AC frequency protection. The digital monitor comes with a 14’ cord that snuggly attaches to the port on the EMS. The display is continuously showing power information displaying each message for two seconds at a time. Combined with the fact that all the Progressive Industries surge protectors have been making in the USA, we believe the Progressive Industries 50 Amp HW50C is one of the best 50 amp surge protectors for you and your RV. Camco has three separate manufacturing facilities in the US, where it creates and assembles many of its high-quality RV accessories. 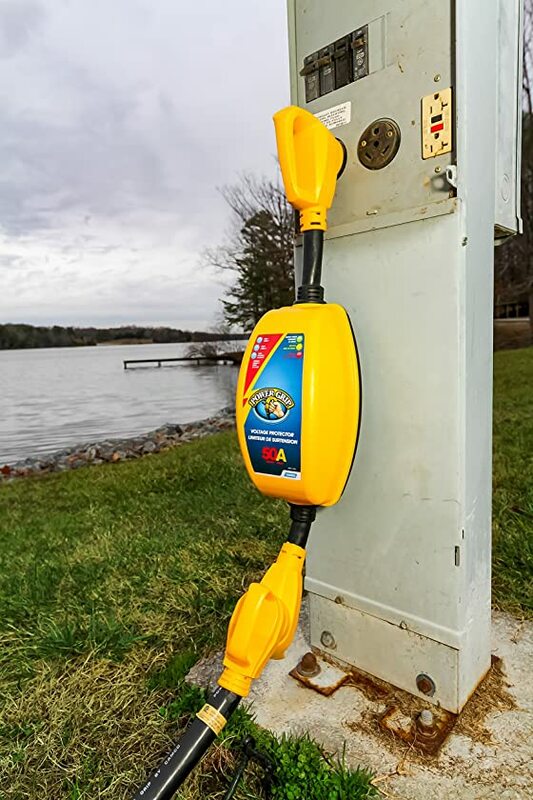 The Camco 50 AMP Power Defender Voltage Protectors are the only models that Camco offers to the market and have quickly become popular and industry exploded. These are certainly some of the best RV surge protectors that you can buy from. The Camco Power Defender Voltage Protector helps protect your RV from damage caused by low or high voltage and power spikes and surges. It automatically disconnects when dangerous voltage levels are detected and reconnects when voltage levels stabilize. Reconnect Delay protects sensitive equipment, such as AC units, by not rapidly cycling power. Includes diagnostic lights for visual indication of faults. Water resistant unit incorporates integrated multilevel surge protection and diagnostic lights for visual indication of faults. The best part of this 50 amp surge protector is that it’s a high-quality model but the price is extremely competitive. Also, Camco’s customer services are awesome. That’s probably why Camco products are the preferred choices of many serious RVers in the USA. 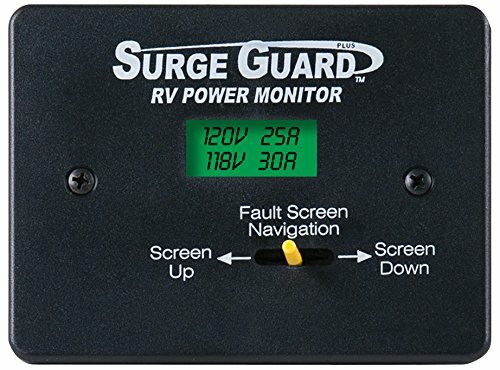 The Surge Guard 40240 50 Amp Hardwire RV Surge Protector is the most expensive RV surge protector that we’ve ever seen and is the one that provides what you can’t get from any other on the market. Besides everything you can get from the Surge Guard 35550, it’s able to protect your RV against max spike current up to 130,000 Amps, which is the highest number in the industry. Plus, the Source Power Connection Diagnostics feature is great, it did a good job of monitoring the condition of the power being supplied to the RV. When it detects there is a dangerous condition, it will disconnect before any damage can occur. 60A full rated contactor (75A resistive) mounted on vibration isolators to ensure quiet operation. Over/under voltage protection. Contactor opens outside of (102-132V) range after 8-second delay. Over/under frequency protection. Contactor opens outside of (54-70Hz) range after 30- second delay. Brown/blackout protection 2 min 15-second delay is initiated after removal of power to ensure AC compressor head bleed off. Feature can be disabled on remote. Bypass switch – Low Voltage between 95- 102VAC and open ground faults can be bypassed by toggling the remote front panel switch to the Bypass position. We believe that if you pick the Surge Guard 40240 50 Amp Hardwire RV Surge Protector, you would never have to worry about your RV whenever hooking it up to power pedestals for shore power at campgrounds, parks and other locations. This is one of the best 50 amp surge protectors you can buy. 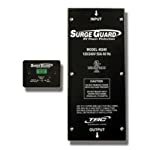 The Surge Guard 44750 30-Amp with Ground is the most economical and offers two types of electrical protection, surge suppression and ground fault protection. It does not protect against miswired pedestals, low-high voltage or open neutral conditions. This is the best 30 amp RV surge protector for you if you just want to protect your RV’s electronics from power surges. Rather than purchasing individual surge strips for individual circuits and appliances, this model protects the entire RV and its contents. It is perfect for Towables, 5th Wheels and Class C Motorhomes. When a power surge or voltage spike occurs, the Surge Guard instantaneously shuts off the power to the RV and automatically resets when the power is restored. When a ground fault condition occurs, power is disconnected in 25/1000ths of a second to protect the RVs wiring, appliances and to prevent fire hazards. Once the ground fault is corrected the reset button must be activated to continue power. This model offers the same features and benefits as the Surge Guard 34850 50 amp. But it’s designed for RVs with 30 Amp service. This model offers the same features and benefits as the Progressive Industries EMS-PT50X 50 amp except it’s designed for RVs with 30 Amp service. This model offers the same features and benefits as the Surge Guard 35550 50A Hardwire Surge Protector – 50 amp except it’s designed for RVs with 30 Amp service.